This product ships with Ice Packs and it is non-returnable, non-refundable. Purchase this product now and earn 5,000 Reward Points! Ultra High Potency Probiotic (100 Billion CFU). An ultra-high potency probiotic blend. 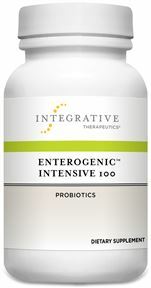 What is Enterogenic™ Intensive 100? This formulation features a broad spectrum of strains of Bifidobacteria andLactobacilli that are resistant to both bile and stomach acid, combined with short-chain fructooligosaccharides (sc-FOS). Since these probiotic strains originate from human microflora, they are naturally compatible with the intestine’s epithelial lining. Utilizes a unique enteric coating to ensure probiotics survive stomach acid and are released directly into the intestine.